Syracuse, NY; April 2, 2018. 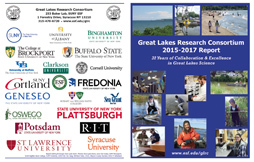 The Great Lakes Research Consortium of 18 colleges and universities in New York State has published its 2018 report, showcasing innovative research conducted by faculty and students at member institutions. The 16-page report, posted at www.esf.edu/glrc, includes information on how students can apply for Great Lakes-related research grants, travel support to attend conferences and workshops, and internships.
. the testing of low-altitude, unmanned aerial vehicle technology for the survey of aquatic invasive species by Dr. Tao Tang and his students at the State University of New York Buffalo State College. "The core mission of the Great Lakes Research Consortium is to steadily advance our understanding of the components, complexities, and interactions of the Great Lakes ecosystem," said Great Lakes Research Consortium Director Dr. Gregory L. Boyer, a noted harmful algal bloom researcher and professor of biochemistry at ESF: The College of Environmental Science and Forestry, Syracuse, NY. The Consortium is supported by member dues and funding from the New York State Department of Environmental Conservation and the New York State Environmental Protection Fund Ocean-Great Lakes Ecosystem Conservation Act program. 0 Comments to "Students: Learn How to Participate in Great Lakes Research"